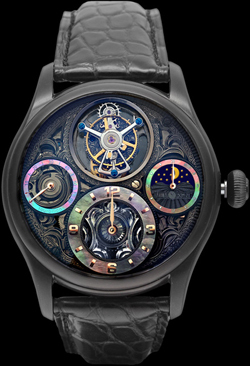 New from the watch company Memorigin – Model Starlit Legend Tourbillon, presented in the current 2012 is a perfect combination of skeletonized design, consisting of five different layers. Rich dark shade of black pearl on the dial represents the next star in the night sky. Star trails are paved with 21 jewel movement and certain components of the dial built a unique picture: the starry night sky is cut by meteorites. Elegant tourbillon set in position 12 hours, in an elegant style and wrapped in notes of romance. Indication of the day and night by the indicator, posted at 3:00 position. New mechanism operates in a safe with a diameter of 36 mm and a thickness of 3.6 mm. Movement consists of 188 components. Cruising the caliber is 70 hours. Movement with double winding spring has a balance wheel, surrounded by anchor mechanism. Round housing news from quality steel to keep the color for a long period covered by PVD-coated in black. Hours Memorigin Starlit Legend Tourbillon comes in alligator strap fitted with a double buckle. You can buy watches from authorized company representatives Memorigin at a price of HK $ 33,800.